NVIDIA introduced a GPU rendering appliance that dramatically accelerates ray tracing, enabling professional designers to interact with computer models of such high visual fidelity that it can largely replace the lengthy, costly process of building physical prototypes. 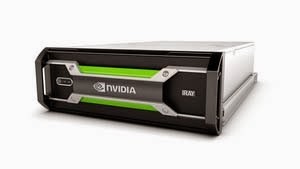 The NVIDIA® Iray® Visual Computing Appliance (VCA) combines hardware and software to greatly accelerate the work of NVIDIA Iray -- a photorealistic renderer integrated into leading design tools like Dassault Systèmes' CATIA and Autodesk's 3ds Max. Because the appliance is scalable, multiple units can be linked, speeding up by hundreds of times or more the simulation of light bouncing off surfaces in the real world. As a result, automobiles and other complex designs can be viewed seamlessly at high visual fidelity from all angles. This enables the viewer to move around a model while it's still in the digital domain, as if it were a 3D physical prototype. "Iray VCA lets designers do what they've always wanted to -- interact with their ideas as if they were already real," said Jeff Brown, vice president and general manager of Professional Visualization and Design at NVIDIA. "It removes the time-consuming step of building prototypes or rendering out movies, enabling designs to be explored, tweaked and confirmed in real time. Months, even years -- and enormous cost -- can be saved in bringing products to market." NVIDIA is working with all software companies that license Iray technology about adding support for Iray VCA. At this week's GPU Technology Conference, Iray VCA is being shown powering a range of applications, including Bunkspeed Drive, from RTT; Iray for Maya, from 0x1 Software; and Iray+ for 3ds Max, from Lightwork Design. Prior to Iray VCA, design teams have typically relied on workstations using one or two GPUs to create 3D visual models. The most sophisticated solutions, involving clusters of machines, have limited interactive quality or require the creation of movies of product designs. And both prevent a full understanding of critical design issues, such as undesirable reflections on a windshield. Iray VCA delivers unprecedented rendering performance using eight of NVIDIA's most powerful GPUs, each with 12GB of graphics memory, which together deliver 23,040 CUDA® architecture cores. It has both 10GigE and InfiniBand connections, so rendering clusters of multiple Iray VCAs can be easily built up over time. Its exclusive Iray cluster-management software dynamically allocates Iray VCAs to meet the demands of the day's workload. Iray VCAs can be conveniently located in an IT center and serve their rendering power on demand, while requiring little or no technical support. 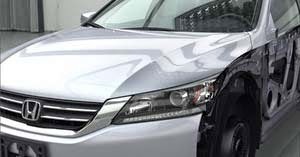 Honda Research and Development's styling design department is an initial user, with a prototype cluster made up of 25 nodes to refine styling designs on future cars. "For our styling design requirements, we developed specialized tools that run alongside our RTT global standard platform," said Daisuke Ide, system engineer at Honda Research and Development. "Our TOPS tool, which uses NVIDIA Iray on our NVIDIA GPU cluster, enables us to evaluate our original design data as if it were real. This allows us to explore more designs so we can create better designs faster and more affordably." Iray VCA systems will be available starting in summer through a global VAR network of certified system integrators, including CADnetwork, Fluidyna, IGI and migenius. Pricing is $50,000 in North America, and includes an Iray license and the first year of maintenance and updates. *Disclosure:An important note, we are just sharing this information to the public, provided by our source. NVIDIA and Honda - Info / Logos / Photos / Images have respective copyrights.